I’m grateful that we are now officially in spring time and can see, against the downpour, the sun trying to push the clouds aside and winning. 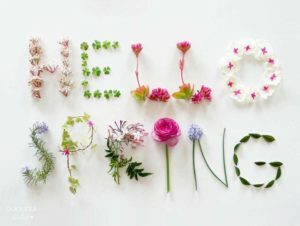 On this day, the spring equinox, it is a good time to plant new seeds and watch them flourish throughout the seasons ahead. This is the time of year we find ourselves doing just that for Yogability, knee deep in organising and planning fundraisers for the year ahead. We have always been lucky in our support and ‘planting’ from our community, friends and users and, as Yogability grows, we find that support is also growing and the job of raising funds to allow us to continue with our services, becomes a group effort, a wider community initiative. We were delighted when the Co-op put us forward for a community grant and have been raising funds for us through their Community Grants Scheme this past year. Our friends and supporters at Lululemon Glasgow are about to host an awesome fundraising event on the 8th April, a day of yoga with all profits going to Yogability. We were really delighted at this offer, via their Here To Be program me, and they will be supporting us in our endeavours when they can during the year ahead. We will be teaching one of the classes and spending the day there to welcome the yogis (all welcome, from beginners to experienced) and to chat. On the home front, a group of our friends and trustees are organising another of our hugely successful 80s disco events on 28th April, you’ll want to look out the Wham t-shirts and wigs for this one! Also closer to home, a group of wonderful friends and supporters are helping me organise a band night at Bearsden Burgh Hall on the 13th May. This is one not to be missed, the bands are going to delight and if that isn’t enough, there will be a ceilidh thrown in. Our annual retreat takes place in the autumn at the very beautiful Eastwood House in Dunkeld. This retreat is a fundraising event and is open to everyone, even if you’ve never stepped onto a yoga mat. This weekend is about connecting whether it be to our breath, on the mat, to nature during the gorgeous walks or to friendship and community, round the communal dinner table. 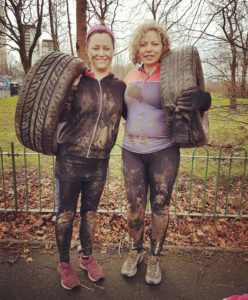 Debbie and I are also planting seeds of a different kind, hoping that in three months time, those seeds will come to fruition in the form of muscles, stamina and strength, enough to complete the Tough Mudder Challenge ahead. So with this in mind, and with excitement, we found ourselves on Sunday morning participating in two hours of Urban Adventure with the Born 2 B Alive folk. The excitement proved the right emotion as we found ourselves running up hills, climbing walls, swinging from trees, dangling over burns by our ankles and pushing fat tyres across muddy ground. This, for me, was a test of reality; it’s all very well thinking how much ‘fun’ Tough Mudder or obstacle courses might be but the reality wasn’t something I had any experience of. Luckily, I loved every minute, although falling in the burn wasn’t exactly a highlight but it was highly amusing. I now know I have the strength to climb a rope but can’t figure out the footwork. I can swing from hoops but my arms are too wee to reach if they’re too far apart. I don’t mind falling in burns. I can shimmy upside down on a rope over water, but if Debbie is laughing her head off at my ‘unique’ method, it makes me laugh too and ultimately, fall into said burn…. It was a brilliant experience and, despite my yoga practice this morning being disturbed by sounds of pain, it was totally worth it.